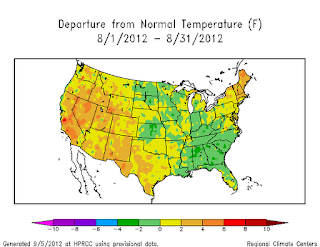 Attention climate conspiracists (lookin' at you, Tom Nelson-bot): The NOAA/National Climatic Data Center (NCDC) analysis for August 2012 is in, and it shows that Summer 2012 was tied for the 3rd hottest on record in the contiguous 48 states of the U.S. That's right, analysis of the raw National Weather Service (NWS) data and even the preliminary August adjustments from NCDC showed the summer would be at least tied with 2011 for second place, but the final analysis posted today lowered the August average by 0.1° to a tie with 2006 for 3rd place. Rather than being 10th warmest, as the preliminary data indicated, August came in at 16th warmest with an average of 74.4°, nearly half a degree below the raw estimate of 74.8°. This is a pattern that CapitalClimate has seen since we started tracking weekly averages at the beginning of summer: The weekly raw averages from 200+ NWS stations are adjusted downward by NCDC, and the monthly averages end up being even more conservative. The average temperature for the contiguous U.S. during August was 74.4°F, 1.6°F above the 20th century average, marking the 16th warmest August in a period of record that dates back to 1895. Higher-than-average temperatures occurred across much of the West, where Nevada tied August 1934 as its warmest August on record, with a statewide temperature 4.0°F above average. 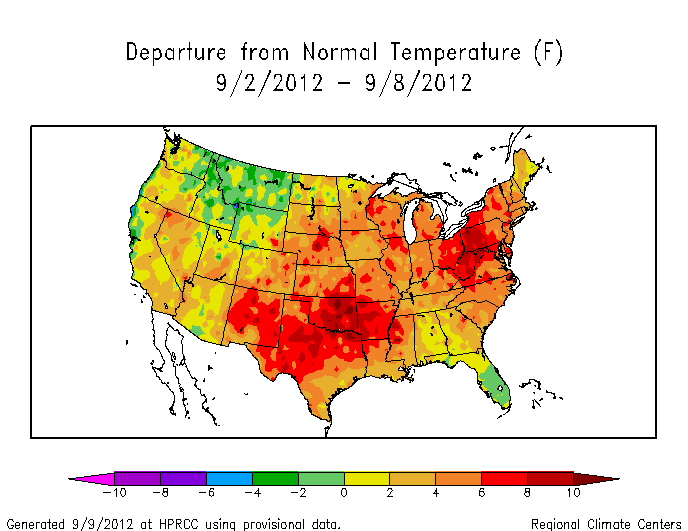 Six additional states across the region had August temperatures ranking among their ten warmest. Much of the Northeast was also warmer than average, where five states from Maine to Delaware had monthly temperatures among the ten warmest. Much of the Central U.S. had near to below average August temperatures, with lower-than-average temperatures across the Ohio Valley and the Southeast. The warmer than average August, in combination with the hottest July and a warmer than average June, contributed to the third hottest summer on record for the contiguous United States. 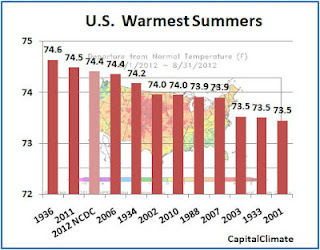 The summer season’s nationally-averaged temperature was 74.4°F, 2.3°F above the 20th century average. Only the summers of 2011 (74.5°F) and 1936 (74.6°F) had higher temperatures for the Lower 48. The summer season was warmer than average for a large portion of contiguous United States, with the exception of the Southeast and parts of the Northwest. Sixteen states across the West, Plains, and Upper Midwest had summer temperatures among their ten warmest. Colorado and Wyoming each had their record hottest summer, with seasonal temperatures 4.4°F and 4.9°F above average, respectively. Much of the Northeast was warmer than average, where seven states from New Hampshire to Maryland had a top ten warm summer. CapitalClimate analysis of temperature data from 215 National Weather Service (NWS) stations shows that the week ending September 8 was 4.0° above average in the contiguous 48 states of the U.S. Just 9 locations, or 4% of the total, were cooler than normal. This is the 39th consecutive week with above-average temperatures. Except for one week in early December, every week in the past winter, spring, and summer has now been warmer than normal.